No. Most of our computers we sell are plug and play. 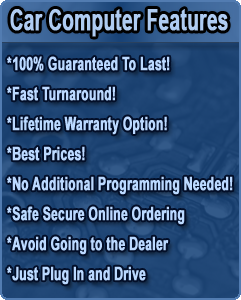 Some of the Ford Computers we sell will need to have a locksmith program keys after install.They are updated with the latest factory software and programmed with your car's VIN. You will be able to return your part within 14 days if it is returned undamaged in its original condition. You will be given the option of getting a refund or exchanging for another. What if I don’t return my old computer? It is important you return your old computer. In the event you don’t return your old computer, you will have voided your warranty and you may be subject to a core charge.